Perfect for outdoor recreation, the standard Outland Firebowl adds ambiance to any outdoor activity and offers the easy alternative to traditional labour intensive campfires. This certified fire pit is safe to use during most campfire bans, you can bring the warmth and experience of a cozy campfire with you anywhere outdoors. Our 58,000 BTU fire bowls are constructed from high quality steel with a protective powder coating and enamel finish for long lasting durability. 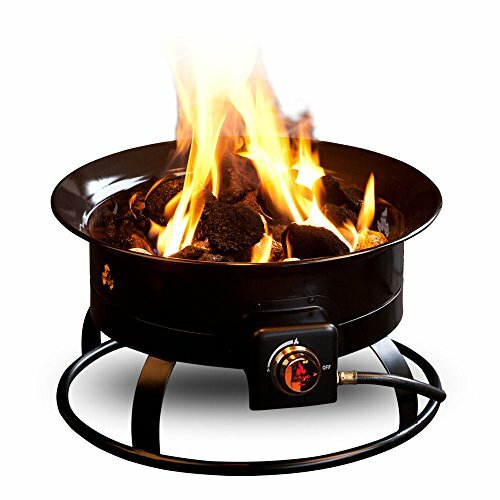 Features of the standard Outland Firebowl include stainless steel burner & fasteners, chrome knob with rubber comfort-grip, and a 1 year Manufacturer’s Limited Warranty on all products. Outland Living is committed to consumer safety and satisfaction; all of our propane fire pits are CSA approved. Selecting a fire pit with an accredited certification ensures not only your safety has been considered but also the design and manufacturing standards have been approved through independent expert testing. In most instances burning a propane fire pit without CSA or UL certification during a burn ban is prohibited. Sit back and relax knowing that your standard Outland Firebowl accurately performs at the 58,000 BTU output advertised while exceeding safety standards. The standard Outland Firebowl uses a standard 20 lb (5 gallon) propane tank (not included) and burns clean and smokeless, giving off enough heat to enjoy with family and friends anywhere outdoors. NEW CSA approved Natural Gas Conversion Kit 780 and Outland Carry Bag 760 now available separately! Includes pre-attached 10 ft. hose w/regulator, propane tank stabilizer ring, and decorative rock set. NEW CSA approved Natural Gas Conversion Kit 780 and Outland Carry Bag 760 now available separately! If you have any questions about this product by Outland Living, contact us by completing and submitting the form below. If you are looking for a specif part number, please include it with your message.